B red for war, they were created to be the ultimate warriors. Impervious to the poisons and contagions of an endless future conflict on an alien world. They were the cloned, blue-skinned Genetic Infantrymen. And they were betrayed. The reboot of the classic 2000 AD character, Rogue Trooper, by one of its original co-creators, Dave Gibbons’ (Watchmen, Martha Washington) The War Machine is now being collected for North America. 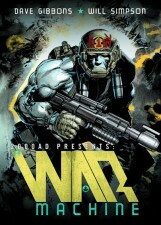 With brutally visceral artwork by Will Simpson (Vamps, Hellblazer), The War Machine is war like you’ve never seen it before. With his comrades dead, the lone GI nicknamed ‘Friday’ must stalk this burnt and pockmarked world in search of the traitor who left him and his clone brothers to die. This is a gritty re-imagining of the Rogue Trooper strip in the way Gibbons had always wanted the story to be told, plus back-up strips by Michael Fleisher with art from Steve Dillon (Preacher) and Kev Walker (Thunderbolts).